Much has been written about the shocking, sudden loss of Laura Wooldridge. I think Joe and Lisa really got to the heart of things with a piece they wrote in Arkansas Outside (We Lost a Hero). While cyclocross was far from Laura's #1 cycling passion, she still made her presence felt. When we needed an official's assistant for the 2012 Reservoir Cross race, she filled in without hesitation. I ran into Laura at one of this year's downtown crits, and she spoke with excitement about working towards her USAC officials license and asked if we'd need officials for the upcoming CX season. She was always a joy to see, whether on the trail or at the race. 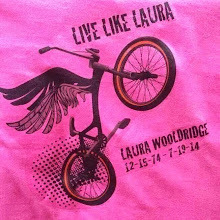 We strongly encourage people to support the Laura Wooldridge Memorial Fund, which will be used to help meet her family’s immediate needs, and also support a memorial in Laura’s name at Pfeiffer Loop, on the north side of the River Trail.